Ichabod: "Our first week as roommates and I befouled the kitchen." I suspect that I'm not on board with how this show is reinventing itself. Maybe it's the FBI thing. I'm interested in Abbie's relationship with Ichabod, Abbie's sister Jenny, and the craziness of Sleepy Hollow. I'm completely uninterested in Daniel Reynolds, Abbie's old boyfriend from Quantico and now her boss. 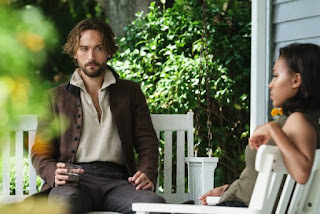 Although Ichabod staring down Reynolds was hilarious. At least this was a strong Ichabbie episode, so there's that. I love that they're roommates now. How adorable was Ichabod cleaning Abbie's house like a Colonial Mary Poppins? They're getting better at the confidante thing, too. 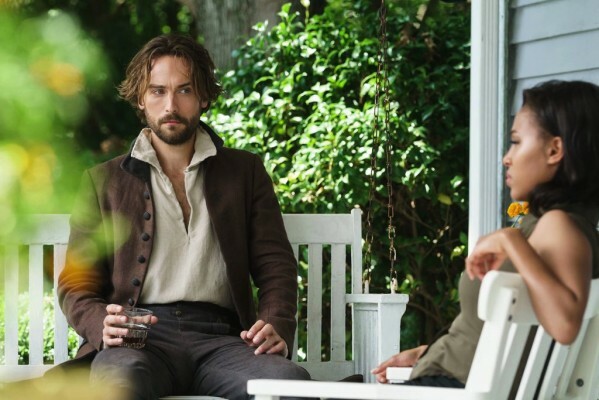 Ichabod told Abbie about his moment of shame at even considering the possibility of betraying the names of Washington's spies, and Abbie told Ichabod that she used FBI resources to locate her father and now she's stalking him. And she hasn't even told Jenny. Bad Abbie, no biscuit. There is something about Nicole Beharie's Abbie this season that is bothering me. It feels like she's set on a new interpretation of her character that isn't clicking. I don't get it, because I loved her before. Maybe it's just me. Or maybe I'm just internalizing the real possibility that this series can't recover from a bad second season and the dreaded reset button. I'm not warming to Betsy Ross, either. This week's flashbacks to September 25, 1776 centered on General Howe in occupied New York City, and Marcus Collins, Pandora's "whispering wraith." Betsy "handled" General Howe, and lost her dress somewhere in the process. Plus she had the guts to jump onto a moving carriage. Eh. Yes, I should give it some time, but I'm already tired of her. There was some forward movement with Pandora, who probably isn't aware of the concept of closed circuit TV. Introducing herself to Abbie in the previous episode may have been a mistake, too. (Maybe Pandora should have come up with an alias that isn't a famous mythical reference.) Her Colonial monster reminded me of the creature in the Angel episode "Are You Now Or Have You Ever Been," right down to the black cloak, the height and the tentacles, but lacking the Foghorn Leghorn accent. Did they have to go for the Rumpelstiltskin thing with saying its name? Come on. Ichabod talking down Marcus Collins also reminded me of James T. Kirk talking down a rogue computer on Star Trek. So Pandora is watering a dark twisted tree with black roses — related to Henry's black rose? TVLine is calling Pandora's tree a "Treevil," which I absolutely love and have to lift for myself. The Treevil is writhing toward the light. Twisted trees and tree branches that grab you are a big thing on this show, aren't they? Maybe it's a way of reawakening our childhood fear of the nasty trees in The Wizard of Oz. Finally, I had gotten the impression from the last episode that the writers were making Jenny our chief hunter of supernatural artifacts, the role they had tried to give to Hawley, whom I don't miss at all. But now they've reintroduced Corbin's son Joe, who didn't go to Quantico after all, and it looks like Joe wants to follow in his father's footsteps. Joe might be okay. I liked him in this episode, which is more than I can say for Daniel Reynolds or Betsy Ross, and I think he and Jenny have some character chemistry. Bad boy Randall was somewhat interesting, too. I just looked through this review and there was way too much complaining. And I tend to look for the positive. This is not a good sign. Maybe I'm just having a bad week. -- Ichabod has applied to make the Archives an historical landmark instead of a Rite-Aid. Turns out he can't because, despite being a founding father, he isn't technically an American. They'd better fix that. -- When Pandora showed up in glasses, I immediately thought, please don't tell me she's masquerading as a librarian. Librarian stereotypes drive me nuts. Thankfully, no. -- Joe is living in an old trailer. Doesn't he own the cabin? I've lost track of what happened to the cabin. -- That bow. Wow, Ichabod. -- Abbie and Jenny's father lives in Saratoga, New York. Not far from Sleepy Hollow, I assume. I hope they cast someone cool to play Daddy Mills. -- That's a nice house, Abbie. I don't think we've seen it before. Have we? Did she buy it when she became an FBI agent? Ichabod: "Half the Colonial Army were after my Bedfordshire clanger." Honestly, I don't want to know. Ichabod: "Just think of the uproar should people discover the true nature of your former commanding officer's demise." Abbie: "Only in Sleepy Hollow does your boss get eaten by a demon." Well, there's Sunnydale. And Cleveland. Ichabod: "I shall find my place in this modern world, but never at the expense of my Colonial soul." Reynolds: (to Abbie) "You spun gold out of straw on this one." Another little Rumpelstiltskin reference. Did you know "Rumpelstiltskin" is in spellcheck? I used to spell it with a "Rumple." That's wrong. Reynolds: "What is it about guys with accents?" I hear what you're saying about Abby. Although she is looking fantastic (great hair, glowing skin), she seems colder, more formal - not so much an underdog this season. Must be the confidence-building FBI training or something. I get the feeling that she's just tolerating Ichabod sometimes, though. Being a witness is not her first priority anymore. She admits she is trying to build the kind of life she always wanted. As long as they don't make Ichabod seem incidental to her real job, I will be ok with that. I'm cautiously optimistic about the season. It's certainly better than the disaster that was last season. I like that they're embracing the monster of the week format. I like that they've simplified the mythology somewhat too. And that was a problem from day one on this show. Pandora is...I'm going to go with boring but maybe she'll grow on me. Thanks for sticking with the show Billie! Here at my house, Abbey's new hairstyle didn't go over too well. My husband told me our 14 yo daughter blurted out " What is up with her hair!" dramatically ( as only a 14 yo can ) when they watched it. I wasn't fond of the shorter hair for either leads. It almost looked like they tried to cut it themselves. I want to like this, but Betsy being Katrina 2.0 makes me sad. Oh well. At least Ichabod and Abbie are adorable as ever. Pandora is working as a villain, so far. Let's hope they can turn the ship around,before it's too late.